Adobe announced plans to significantly update Adobe Creative Cloud video desktop apps and Adobe Anywhere for video. These new capabilities, coming soon, build on Adobe’s industry-leading integration across video workflows enabling video professionals to create, collaborate and deliver high quality productions across multiple screens. Key updates include powerful new media and project management tools in Adobe Premiere Pro CC; a refreshed user-interface across all Adobe video desktop apps; and more streamlined production workflows empowering video professionals to edit more efficiently. Important new updates will also be added to Adobe Anywhere, which enables large virtual teams of talent to collaborate and efficiently shoot, log, edit, share and finish video productions together. Adobe also announced new capabilities to Adobe Primetime, the industry’s most advanced TV delivery and monetization platform for programmers and pay-TV service providers. Adobe is previewing these major updates at IBC 2014, Europe’s largest professional broadcast show held in Amsterdam. The company will demonstrate its new solutions at the RAI Convention (Hall 7, Stand 7.G27) Sept. 12-16. Adobe professional video and broadcast tools will also be presented in more than 70 partner booths throughout the IBC exhibit. Support for cutting-edge hardware and standards is accelerated via Adobe Creative Cloud, enabling the company to respond quickly to new hardware and software standards. Key updates extend native file support, with the addition of AJA RAW. Performance enhancements include accelerated Masking & Tracking; and new GPU-optimized playback that delivers better performance when viewing extremely high resolution 4K and UltraHD footage from Phantom Cine, Canon RAW and RED R3D files. A refreshed user-interface across all the video applications supports HiDPI displays for both Mac Retina Displays and Windows 8.1, providing a cleaner appearance enabling video professionals to stay focused on their projects. 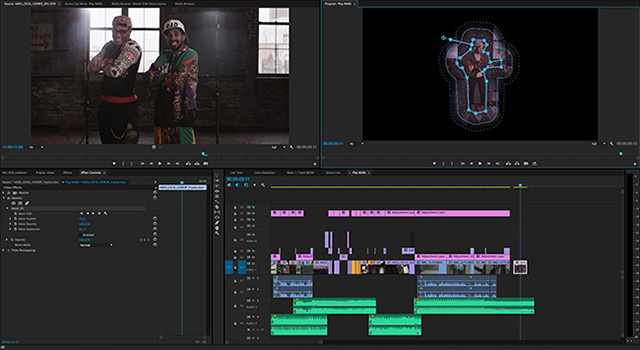 Powerful new media and project management features, including Consolidate & Transcode; Search Bins; and Multiproject workflows offer more ease and flexibility, at the project level, so Adobe Premiere Pro CC users can complete tasks more efficiently. Adobe Media Encoder now includes Destination publishing with preset options so users can render, deliver and share projects to multiple locations such as FTP sites and their Creative Cloud folder, automating the delivery process. Additionally, Extended Match Source support now includes added support for the QuickTime and DNxHD formats, simplifying the workflow for users who are transcoding or rendering content. Streamlined workflows and ongoing refinements make everyday tasks easier and faster inside Adobe CC video apps, including Timeline Views in Adobe Premiere Pro CC; Curve adjustments and Look Hover previews in Adobe SpeedGrade CC; and Rough Cut Dissolves and keyboard shortcuts for tagging in Adobe Prelude CC. Adobe today also announced important updates planned for Adobe Anywhere, the collaborative workflow platform that empowers users of Adobe professional video solutions, such as Adobe Premiere Pro CC and Adobe After Effects CC, to work together using centralized media and assets across standard networks. Adobe Anywhere complements Creative Cloud applications and enables deep collaboration for large organizations working with video, including broadcasters, educational institutions and government agencies. Enhanced support for Adobe After Effects CC enables visual and motion graphic artists to collaborate more effectively so they can spend more time working creatively and less time searching for missing footage and collecting files. Additionally, new options in the Adobe Anywhere app for iPad are added, so users to scrub and review video footage faster.